Discover new tea blends from our ever growing selection every month! Delivered straight to your door. Receive a FREE Tea Cup Infuser with your 6 month tea subscription box! Each subscription box contains a 4 packets of loose leaf tea, which brews at least 40 cups of tea throughout the month! Our tea subscription will give you four of the very best tea blends hand selected for you each month, delivered direct to your door, complete with tasting notes, recipe cards and the opportunity to become join in the conversation online as part of our online community #sukiteatreasures. Over the duration of your selected tea subscription, you'll receive an extensive range to try and sample including black teas, green teas and herbal teas, as well as white, oolong and fruit teas. 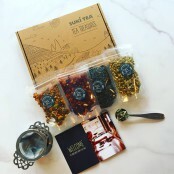 This tea subscription makes a wonderful gift for all the tea fanatics in your life!! The tea subscription box is sent as a large letter, so no-one needs to be home when it arrives! Tea subscription boxes are sent out on the 25th of each month, don't forget to add your recipient's name and address in the delivery address section during checkout! Free UK Delivery for all subscription boxes. You must place your subscription order by midnight on the 24th of each month to ensure that you receive the next monthly subscription box - if you place an order for the subscription box on or after the 25th of the month, your order will go out at the end of the following month...this is to ensure everyone receives there subscription box at the beginning on the month. Boxes ordered in the month of December will be dispatched on 29th December for delivery the first week in January. For boxes going beyond the UK to there will be a postage charge on top of the cost of subscription, please add to your basket and then enter delivery address and your cost will be shown, or alternatively see T&Cs for price table. + FREE Suki Stump Teapot!! Too early to start thinking about Christmas? We think not! Service rating : Ottimo Tea, consiglio caldamente un abbonamento anche di tre mesi che vi dará l'opportunitá di provare diversi tipi di tea senza acquistare il pacchetto senza averlo provato, sicuramente una volta provati i primi tea li vorrete tutti, provare per credere. Una quantitá di tea maggiore... Service rating : Ottimo Tea, consiglio caldamente un abbonamento anche di tre mesi che vi dará l'opportunitá di provare diversi tipi di tea senza acquistare il pacchetto senza averlo provato, sicuramente una volta provati i primi tea li vorrete tutti, provare per credere. Una quantitá di tea maggiore nelle bustine dell'abbonamento sarebbe perfetta e molto graditá. Acquistare un SetRegalo (teiera e tea) é un buon inizio e la qualitá é ottima. Product : tea decisamente ottimi, sono rimasto un po' deluso dalla quantitá di tea nelle bustine e non sono riuscito a trovare i tea dell'abbonamento nello store SukiTea, magari devono solo aggiornare il sito. Service rating : Grazie per il vostro feedback! Service rating : We really enjoyed the tea that we received, for the most part. We always looked forward to receiving our gift box in the mail. Even though we live in the USA, we found that the delivery always came near the beginning of the month. Product : We really enjoyed our tea, for the most... Service rating : We really enjoyed the tea that we received, for the most part. We always looked forward to receiving our gift box in the mail. Even though we live in the USA, we found that the delivery always came near the beginning of the month. Product : We really enjoyed our tea, for the most part. There were a few flavors that we didn't care for, but that was to be expected in a box of samples. This is my third or fourth order. I love Suki tea!! Service rating : Perfect so far. Product : Lovely selection of teas. Our Subscription box really is the best way to taste something new, it's great to hear you enjoyed the selection of teas in your boxes!